If you have failed to make one or several payments on a debt, the creditor is likely to call you to ask for money. To give you a friendly reminder. Sometimes debtors genuinely forget about making a payment or there is some problem with the transfer, and a prompt call can settle the situation and prevent it from escalating. To convince you to make payments and get your account up to date. If you have been a good customer so far, the creditor probably doesn’t want to set your account into default as soon as possible and lose your as a client. Instead, the creditor wants you to prioritize paying them and keep your account with them active. To set up a repayment plan for your debt. It is cheaper and more efficient for the creditor to set up an instalment plan directly with the debtor than utilizing a collection agency or taking the issue to court. When the creditor calls, don’t be afraid to explain that you are having trouble making large enough payments every month and that you would like to arrange an instalment plan that is possible for you to adhere to. The creditor will probably want to have more information about your financial situation before they offer you any plan, e.g. monthly income, expenses, debt burden, dependants, and so on. To inform you that your account will go into default if you don’t pay and that they are ready to proceed with further actions to get their money back. Please note that for debts covered by the Consumer Credit Act, the account can not go into default until you have been issued a default notice and two weeks have passed without you getting your account up to date. Should I make a card payment over the phone? When a creditors call, it is common for them to ask you to pay your outstanding debt – or part of it – immediately by giving them credit card information over the phone. You do not have to do this. You have a duty to pay your debts, but you don’t have to do it by handing over credit card information over the phone. Being on the phone with a creditor can be a stressful situation, and it is easy to be pushed into a rushed decision. In many cases, it is better to ask the creditor to send you a physical bill that you can use to make a payment once it arrives, e.g. by using your internet bank. If you have several debts and obligations, and not enough money to pay them all on time, you will need to prioritize them. Making a payment to once specific creditor just because they happened to call might not be in your best interest. For instance, it is more important to prioritize paying your landlord to avoid getting kicked out, than to pay down that old unsecured shopping catalogue debt. If you have several debts and find it difficult to juggle them all, contact a free debt counselling service to make a comprehensive repayment plan that takes all your debts and obligations into account and fits into your monthly budget. The creditor is not allowed to discuss your debt with anyone else who answers the phone, unless you have given the creditor permission to do so. This includes family members, partners, flat mates, etc. If someone else answers the phone when the creditor calls, the creditor should ask to speak to you and not give out any other information. If two or more persons are jointly responsible for a debt, the creditor can discuss the debt with any one of these persons over the phone without obtaining permission from any of the others. Is the creditor allowed to call me at work? If you have provided the creditor with your work phone number, the creditor is allowed to call you at work. If you want the creditor to stop calling you at work, contact them and ask them to stop using that number and to remove it from their records. Provide them with another phone number that you wish for them to use instead (home land line, personal mobile phone, etc) or ask them to correspond with you in writing instead. If they continue to call you at work, you can make a complaint. Do I have to talk to the creditor over the phone at all? If you prefer to communicate with the creditor in writing, that’s your prerogative. If you have already answered the phone, politely ask them to send information in writing instead and make sure they have the right address on file. Of course, if you ignore all the mail they send and refuse to answer them in writing, they will keep calling you and might even send debt collectors to your doorstep or take the issue to court. 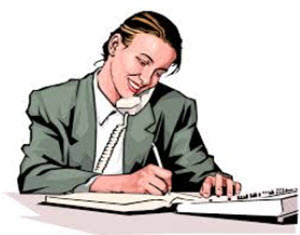 If you prefer to communicate with a creditor in writing, send them a letter asking them to stop calling you. Demand that they remove your phone number from their records. If they continue to call you after this, even though you are promptly answering their written correspondence, you can file a complaint. The law doesn’t specify how often a creditor may call you or at what hours of the day. It does however say that calling you too often or at unreasonable hours isn’t permitted. Of course, this is open to interpretation. If certain hours are “unreasonable” to you, make sure your creditors know. You might for instance be working nights and be asleep during the day, and would prefer it they would call you in the evening instead. Please remember that each individual creditor is allowed to call you. If you have ten different debts and ten creditors call you in the same week, that might feel like harassment from your point of view, but they have not harassed you since each creditor has only made one call. As mentioned above, you can ask creditors to stop calling you and contact you in writing instead.